This course is offered jointly by UTS: Law and UTS: Communication. It provides students with a range of professional and analytical skills grounded in sociology, social policy, politics, public history and international studies, for either legal or social science practice. It is designed for students who want to use their professional legal qualification together with social research, policy development and political advocacy. Honours relates to the law component only and students must successfully complete both of the research subjects: 76090 Research Methodology and 76040 Research Thesis. Strong research skills are valued highly in contemporary professional practice. The program provides full-time study for students wishing to obtain a professional legal qualification that satisfies the requirements for admission as a lawyer together with specialisation in social, cultural and communication theory and practice. Studies in social inquiry increase students' employment options in the diverse fields of social science, media and communication, as well as extending their knowledge of the broader context in which the legal system operates. Students have the opportunity to engage in deeper study of the law by studying 76090 Research Methodology and undertaking 76040 Research Thesis. This course can be a pathway to higher degree research programs. The course aims to promote understanding of how communities and political systems work, along with positive and effective intervention skills. Career options include lawyer in business or media organisations, community or public sector, as an advocate, policy maker, political activist, political adviser or social or media researcher. The course comprises 240 credit points. The study components for course completion are as follows. a 6-credit-point technology law, policy and ethics (Capstone 1) subject, a 6-credit-point applied project in law, innovation and technology (Capstone 2) subject, a 6-credit-point research methodology subject, a 6-credit-point research thesis subject, and either: a disruptive technologies and the law subject, or a local internship. All options shown are law options and are to be drawn from those on offer in CBK91100. Students wishing to study the new major MAJ09444 Legal Futures and Technology need to study 76106 Technology Law, Policy and Ethics (Capstone 1) in the Autumn session of their final year and 76107 Applied Project in Law, Innovation and Technology (Capstone 2) in their final Spring session. 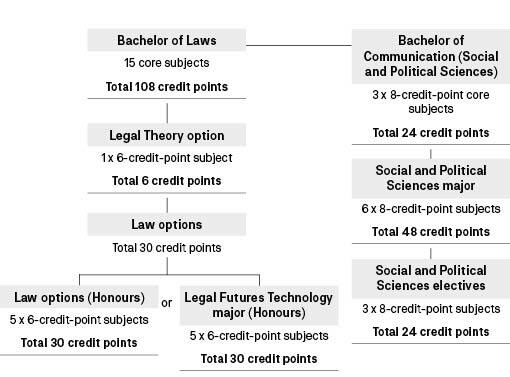 The Bachelor of Laws (Honours) may be awarded with first or second class honours, which does not require an additional honours year. Honours candidates must complete 76090 Research Methodology and 76040 Research Thesis within the course. The rules concerning the Bachelor of Laws (Honours) can be found in undergraduate course information.